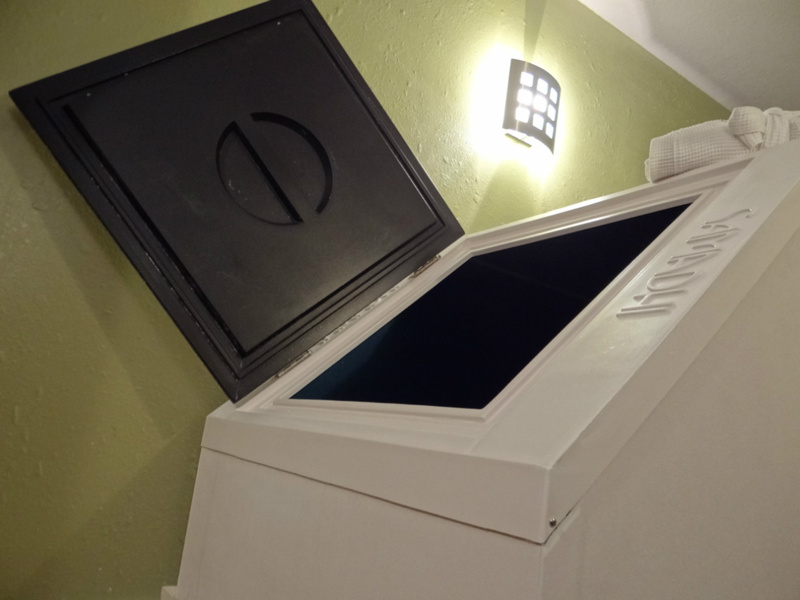 A Flotation Tank is a large, enclosed, salt water bath designed to minimize sensory input to the brain. The water is ten inches deep with 900 lbs of epsom salt dissolved into it. This creates such buoyant water that anyone, no matter how dense or large they are, can float like a cork on top of the water. There is virtually no gravity and the temperature of the environment is the same as the body, the tank makes it so the body has nothing to feel. The tank is completely dark and silent so there is also nothing to see, hear, smell or taste. Since the user wears nothing into the tank, lying in such a senseless environment for even a short period of time will give the user a vacation from their body, their stress, tension and their pain. This environment will also allow the user an unique and intimate experience with themselves found nowhere else. The float tank creates a tranquil environment free of distraction and stimulus. Without the intense stimulation of our modern environment we are able to experience ourselves as pure consciousness! This experience has provided inspiration for many people to begin the journey of extreme self transformation. Along with its ability to inspire us to live life to the fullest, flotation therapy provides deep relaxation and pain relief for the mind and body. The use of a float tank has been shown to dramatically lower the stress hormone cortisol which causes anxiety, suppresses the immune system and contributes to weight gain. Stress is the number one cause of disease. When we relieve stress from our body and mind we get to experience our being at optimum health. This means a body free of pain & tension, and a clear, relaxed, focused mind. By keeping ourselves in optimum health we can meet the demands of modern life as our most expansive selves! Need some rich brain science? Dr. Justin Feinstein is Director of the Float Clinic & Research Center (FCRC) at the Laureate Institute for Brain Research (LIBR). The FCRC’s mission is to investigate the effects of Floatation-REST on both body and brain, as well as explore its potential as a therapeutic treatment for promoting mental health and healing. Anxiety and depression are the two most common psychiatric conditions, affecting over 25% of the population, and representing the leading cause of disability, worldwide. Recent meta-analyses and large-scale clinical trials suggest that only about half of patients improve with treatment, with substantially poorer outcomes and adherence in patients with comorbid anxiety and depression. Given the poor treatment response and adherence to currently available therapies, it is imperative to explore new ways of helping individuals with anxiety and depression. This presentation unveils the results from the first float study ever conducted in a large group of patients spanning the spectrum of different anxiety and stress-related disorders, including PTSD, Panic Disorder, Agoraphobia, Social Phobia, and Generalized Anxiety. The findings detail the clinical and physiological changes induced by the float experience, along with a discussion about safety considerations with this population. Research papers based on the findings presented in this video have since been published, and can be viewed here and here.